The Empires Expansion introduces 3 new player races allowing you to play from 2 to 7 players. It adds more strategies, classes secret goals, royal decrees and of course more custom meeples to the game. 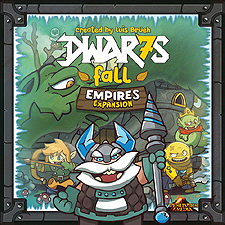 Play as Elves, Ogres, or Crystal Dwarfs! Hunt new monsters!